ConnectPV 1000V Combiner Box products are based on a core product architecture optimized for DG and utility scale solar projects, simplifying project design and specification. Options and accessories allow Project Engineers to configure the Combiner Boxes for each project’s unique requirements – reducing labor costs and maximizing system performance. 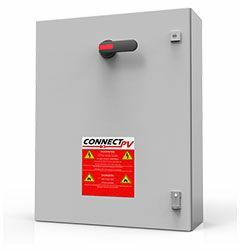 ConnectPV 1000V Combiner Boxes incorporate “best-in-class” components combined with rugged mechanical designs to maximize reliability over the projected life of the project. Compatible with grounded systems – negatively or positively grounded with fuses on the ungrounded string input conductors, or ungrounded systems with fuses on both string input conductors. Additional Options, Accessories, and Prefabrication Available – Please contact ConnectPV with your requirements.